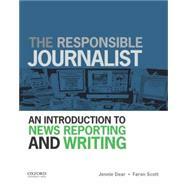 The Responsible Journalist: An Introduction to News Reporting and Writing teaches reporting and writing skills from a liberal arts perspective with the understanding that at its heart, journalism is about public service. The text presents journalism as an approach--one that involves careful thought, ethical decision-making, skepticism, an attention to accuracy and an emphasis on truthfulness. Jennie Dear is a former English professor who is now a freelance writer. Faron Scott is Professor of English and Communications at Fort Lewis College. Unit 1: What Distinguishes a Good Journalist? Chapter 2: How Do Ethics and Critical Thinking Apply to Everyday Reporting? -- Who are the stakeholders? Truth telling: What do we know is true? ---- Is the autopsy report factually accurate? ---- Do you include the blood test results? ---- Do you include the murderer's accusation? Justice: What's fairest to all the stakeholders? -- What's this mean for a working journalist? Chapter 3: How is News Language Different? Chapter 4: How Do You Tell a Basic News Story? -- What does a journalist use from the Web? -- What can be copyrighted-and for how long? Box 7-3: How do you know whether your use is "fair"? Box 7-4: when would a journalist be in danger of violating copyrights? Chapter 8: Who Gets the Spotlight? Chapter 9: How Do You Conduct an Interview? Chapter 10: How Do You Report What Sources Say? -- In general, don't mark dialect in quotes. -- Quotation marks mean that what appears between them is what someone actually said. -- Provide context and explanations before a quote, rather than after. -- A reporter should not take quotes out of context. -- Just because a source says something does not mean you have to report it. -- News stories emphasize the speaker rather than the reporter. -- News stories use "said" or "says." -- Follow basic punctuation rules for quotes. Box 10-01: For broadcast stories, attribution comes first. Box 10-02: How do you make sure you're not defaming someone? -- Research before you talk to people. -- Treat your sources with dignity. -- Keep a professional distance. ---- What do other businesses need to know about each other? Chapter 13: What About Other Kinds of News Stories? When are opinions not helpful? ---- A news blog sticks to basic journalistic principles. ---- A news blog presents informed opinions. ---- A news blog can provide in-depth information about niche subjects. -- What does this mean for a working journalist?